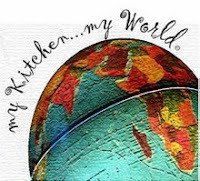 This week My Kitchen, My World is heading to Jolly, Old England and while I had grand intentions of whipping up a few scones and some potted shrimp, the real world got in the way this week. Between school and practices and dh traveling out of town for work this week, it just didn't happen. Instead, we opted for an old favorite: Fish and Chips. I couldn't help myself though. I had to jazz up the tartar sauce and as a result it's more a Creole Tartar Sauce than English. Sorry! But I had to share the recipe anyway. It was too delicious! 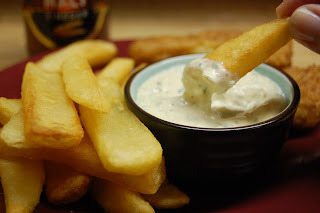 I'm not a tartar sauce fan at all and I don't care for it with fish, actually. But it was awesome with the "chips". Yum! Authentic Fish and Chips from Tasty ... and Gluten Free! Combine all of the ingredients a food processor. Mix on high for 1 minuteor until blended. Mmmm, I love fish and chips. This is what hubby was hoping I would make. We love it with lots of malt vinegar. Yum. Good choice! My husband and son love fish and chip (with malt vinegar) they even went to William Sonoma and bought them self an electric fryer 2 yrs ago. They wanted to be able to make THE authentic fish and chip. They've only used it once, and I don't really like to deep fry anything in general, so now it's sitting in my cupboard in the garage! What a waste of money! YUM! I love fish and chips! Great pick!